The new Ophelia Invitation Suite is one of the most romantic suites Shine Wedding has ever designed. 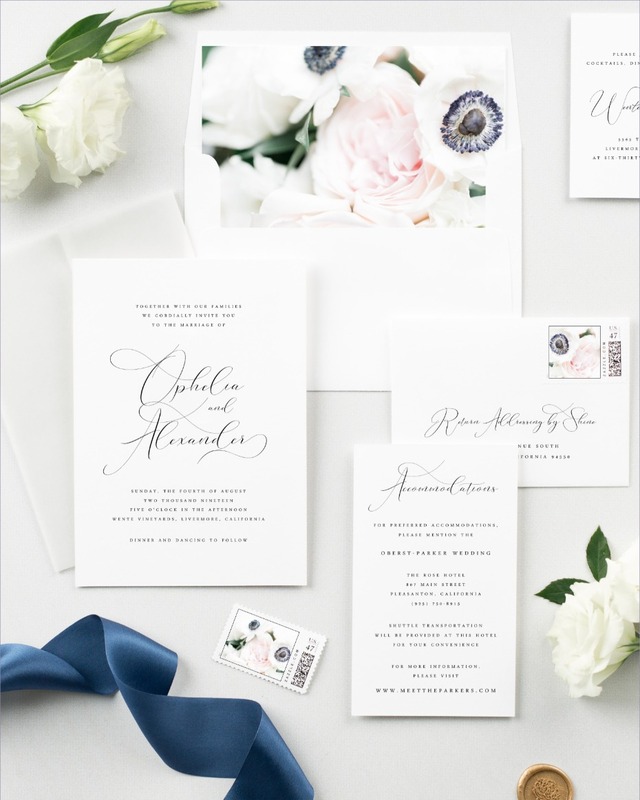 The elegant and clean design starts off with a small caps font and leads into a delicate calligraphy focus on the names of the bride and groom. The perfect mix of drama and elegance, the clean design is truly unforgettable. Ophelia is outfitted with their elegant Emma florals, including an envelope liner, belly band, and matching stamps that are available in several sizes (postage sold separately). Emma florals are made of blue anemones, blush spray roses, lisianthus, and white mums. The overall design is then polished off with a velum jacket and gold wax seal. Want to customize the look? 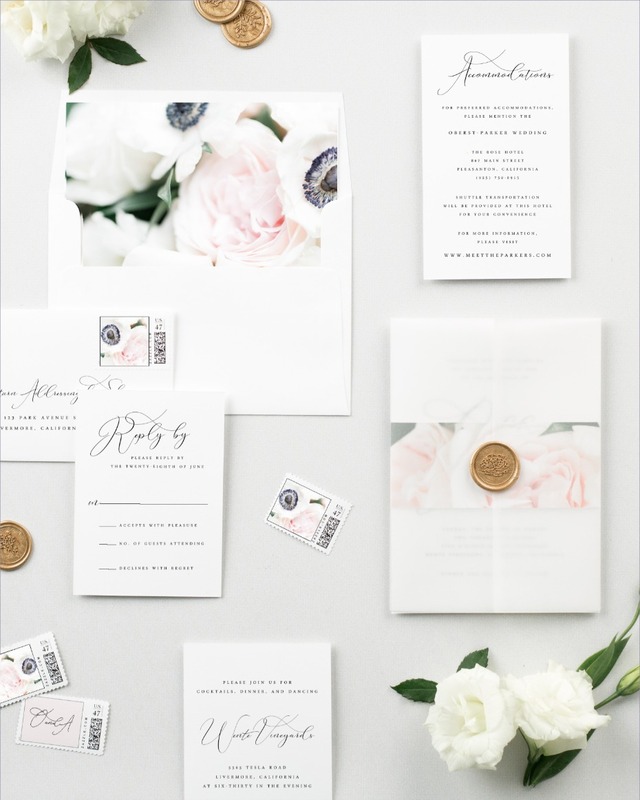 There are 12 florals designs to choose from and 4 wax seal colors, so you’re sure to find the perfect combination to perfectly match the style of your wedding! Altogether, this suite includes custom floral stamps, an outer envelope, inner envelope + liner, invitation, large enclosure, response card + envelope, small enclosure, and matching Emma flora belly band to hold it all together. The suite is beautifully printed on their thick matte cardstock in black. Shop now. Did you know Shine offers addressing services? No joke, their guest + return addressing highlighted in the video above will save you lots of time and energy. They even have name printing services and the cutest custom stamp designs (postage sold separately) available in large, medium and small sizes. If you’re looking for a cohesive look throughout your entire wedding, Shine also offers matching ceremony programs, table numbers, place cards, and more! Shop now to see more amazing designs and additional props available to complete your suite from Shine Wedding. 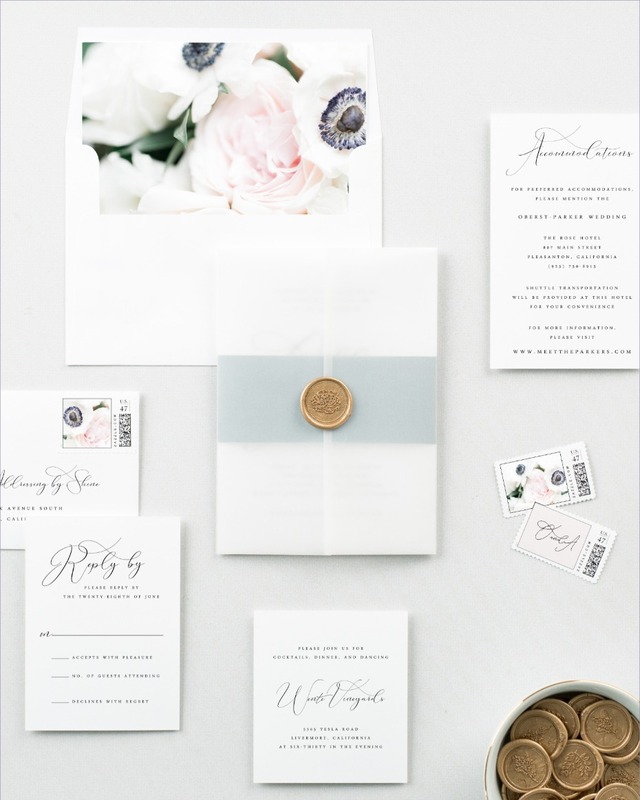 We partnered with Shine Wedding to share their gorgeous new invitations with you. As always, thank you for supporting our sponsors!